With unparalleled views over Exmoor from the upstairs living area and private patio space, you will be spoilt for choice as to whether to enjoy outdoor eating and relaxing with the Gas BBQ or holing up inside with the log burner, comfy chaise sofa and chair and Smart HD TV with Freeview. 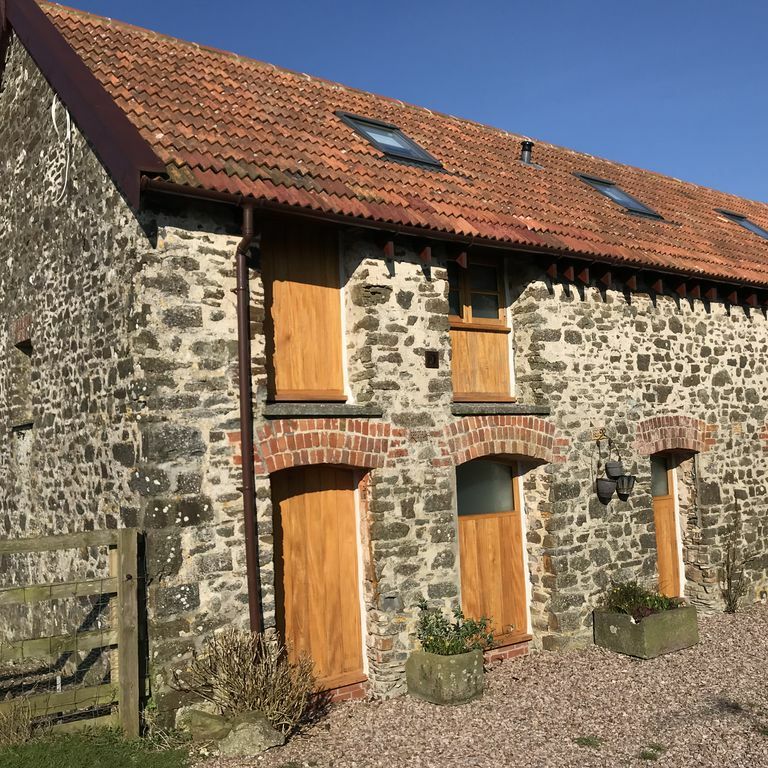 Exmoor View has two bedrooms accommodating 4 people, one with a double bed and en-suite shower room and the second a twin room with ensuite bathroom. Both rooms feature flat screen TVs and contemporary styling throughout with hand-painted furniture, exposed stonework and stylish bath suites. There is a utility room on the ground floor that give you washing and storage space. Upstairs, you lead into the living area via a glass and steel balustrade onto a fully-fitted kitchen with all modern facilities including dishwasher, induction hob, split-level cooker and microwave. All the utensils, crockery, cook and bakeware that you will need and a spacious breakfast bar to watch the chef at work, glass of wine in hand. The kitchen opens onto the dining area with traditional farmhouse table and makes the most of the view surrounded by windows, featuring the landscape with it's ever changing vista. After dinner make the most of the living area as it envelops you with it's charm whether you are watching the TV, selecting one of the DVDs for the Blueray player, surfing on the free WiFi or playing one of the board games. There are also books and cookery books as well as local newspapers and magazines, leaflets and maps to make your stay as easy as possible. The colour inspiration for Exmoor View is the variety of shades that the landscape delivers, from the brown of the earth, green of the grass, stone walls to the popping yellow of the rapeseed, inspiring our choice of wall colours and sofa. Where better to immerse yourself in this landscape than your private patio area with it's seating and dining area, gas BBQ and attractive patio plants. Relax and enjoy. Every guest party receives a complimentary welcome hamper of breakfast items and local provisions to get your holiday started including bacon, pork or vegetarian sausages, our own eggs, mushrooms, tomatoes, home made bread, preserves, juice, fruit, coffee, tea, milk. some liquid refreshment and a homemade cake. Tasty two-course homemade evening meal ready in your fridge on arrival with a variety of alternative options including chicken and leek, fish or cheese and potato pie, vegetarian or beef chilli, beef or vegetarian lasagne, chicken or vegetarian curry, vegetarian or pork sausage casserole, fruit crumble, sticky toffee pudding, summer fruit jelly and lemon posset or Southwest cheeseboard. Each meal is provided with all the trimmings and is made with love and care in the farmhouse. BBQ treats on arrival or during your stay including burgers, sausages, chicken and kebabs, variety of salads, bread rolls, homemade pickles and choice of dessert. Catering for special occasions such as birthdays or anniversaries. If you want anything prepared for arrival or during your stay, you only need to let us know. Currently we have a growing flock of sheep and Spring gives you the opportunity to join us in lambing, bottle-feeding lambs, shearing and rolling fleeces. Join us at feeding time for our micro pigs, Pinky and Perky. Come in the pen and make sure that they have a satisfying scratch. Help us collect eggs from our brood of hens in the morning and wonder at the straight backs of our Indian Runner Ducks and why they don't fall over backwards (apparently they can do!). Ducks, geese and a cheeky guinea fowl make up the rest of the contingent whilst you are guaranteed a warm welcome from our Sprocker puppy, Ruby. Although we are surrounded by fields and countryside and no near neighbours, we have a wonderful local pub in walking distance (Castle Inn) - make sure to book in advance. There are some lovely walks and cycle rides straight out of East Trayne and the neighbouring villages offer a variety of pubs within a short drive. George Nympton also has a Grade 2 listed, 15th century church worthy of a visit and the village community runs a variety of events throughout the year, which we will be sure to let you know about during your stay. It's only a five minute drive to the bustling market town of South Molton. There you will find a thriving Pannier market on Thursdays and Saturdays from 8am to 1pm, offering everything from foodstuffs to arts and crafts. The town also has a variety of independent shops from a cheese shop and delicatessen, clothes shops and a good range of vintage homeware outlets to great restaurants, takeaways and tea shops plus a Sainsburys for your day to day needs. The town also has a museum featuring an original cider press as well as petrol stations, hairdressers, doctors, dentists and a local hospital. There is a swimming pool and the Quince Honey Farm is a great attraction for children who want to be a bee keeper for a day. Regular events are held in the town including vintages rallies, antiques fairs, October's Apple day and food festivals amongst many more. For more on what's going on locally visit South Molton Information. 25 minutes away and you can be in Barnstaple with it's own Pannier Market, theatre, cinema, attractions and larger range of shops and restaurants and perhaps even make a day trip to Exeter, only 50 minutes by car. North Devon is a unique part of the country, combining breathtaking countryside with a varied and spectacular coastline. East Trayne is a perfect location to explore both. We are three miles from Exmoor and nearby South Molton is referred to as its gateway. The beautiful, varied landscape of Exmoor National Park will take your breath away from lush green forests to wide expanses of moorland and deep valleys. Look out for the Exmoor ponies, the Historic Tarr Steps and perhaps take the steam train from Woody Bay (Lynton and Barnstaple Railway Trust) above the stunning Heddon Valley. As you cross Exmoor to Lynton and Lynmouth, with its funicular water-powered lift (Lynton and Lynmouth Cliff Railway), carry on to Valley of the Rocks and you reach the most beautiful and varied coastline imaginable. Then to the sheltered cove with it's rockpools at Combe Martin, along to Ilfracombe showcasing the preserved Victorian Tunnels Beaches and the imposing statue of Damien Hirst's 'Verity' guarding the harbour, which offers a variety of sightseeing and fishing trips by boat or perhaps do a day trip to Lundy Island on MS Oldenberg. Then over to Woolacombe, Puttsborough and Croyde for sea, sand and surfing with more than a few little hidden coves offering peace and quiet even at the highest of seasons. Walking and cycling are a must with a multitude of paths and byways plus the South West Cost Path to traverse. For the little ones there are many theme parks and attractions to enjoy including The Big Sheep, The Milky Way, Watermouth Castle and Exmoor Zoo to name but a few. What a truly beautiful place to stay. The cottage was just perfect so clean, cosy and so well equipped. We did not want to leave. Highly recommend. Superb holiday cottage, the approach enhanced by being greeted by Pinky & Perky, two very friendly pigs. The inside of the cottage didn't disappoint, from the two ground floor beautifully appointed en suite bedrooms to the first floor open plan kitchen and sitting room. The cottage is the best equipped we have ever stayed in and the welcome hamper was beyond superb. The evening meal that we had ordered for our first night was absolutely delicious - so delicious in fact that there was not a crumb left to give to the pigs!!!!! We shall definitely be returning to this wonderful place. The town also has a variety of independent shops from a cheese shop and delicatessen, clothes shops and a good range of vintage homeware outlets to great restaurants, takeaways and tea shops plus a Sainsburys for your day to day needs. The town also has a museum featuring an original cider press as well as petrol stations, hairdressers, doctors, dentists and a local hospital. Then to the sheltered cove with it's rockpools at Combe Martin, along to Ilfracombe showcasing the preserved Victorian Tunnels Beaches (Tunnels Beaches) and the imposing statue of Damien Hirst's 'Verity' guarding the harbour, which offers a variety of sightseeing and fishing trips by boat or perhaps do a day trip to Lundy Island on MS Oldenberg.